When the Celts occupied Europe, long before the birth of Christ, Halloween was a time for all who lived good lives to feast - similar to Thanksgiving. This All Hallow's Eve was also the night when ghosts and goblins walked the earth. People lit candles and masqueraded in frightening costumes made of animal skins to ward off the spirits of the dead, who returned to earth as wandering cats, witches and ghosts. People in costume began to visit homes, asking for treats - those who gave them would be assured of having a good year; those who did not were warned to watch out for spirits. 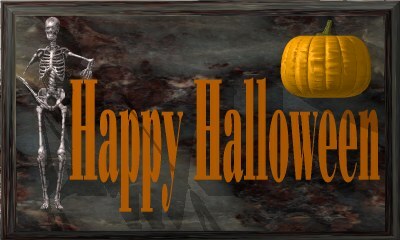 The Romans, after conquering England and France, introduced their own touches to Halloween. They bobbed for apples and gave nuts to their neighbours. The Italians left bread and water, and lit lamps before going to bed to appease visiting ghosts. Other Europeans put out doughnuts and milk for returning spirits while still others placed empty chairs in a circle, one for each member of the family and one empty for an expected ghost. In the nineteenth century, Irish immigrants brought the holiday to North America, where it has evolved to become a national celebration. Halloween today is a time for children to dress up in costumes of ghosts, witches and other supernatural beings, make lanterns out of turnips or pumpkins and play games such as 'dunking' for apples. Local superstitions about this night abound. The American custom of "Trick-or-Treating", originated in Great Britain as 'Mischief Night', which was the custom of soliciting fruits and sweets from neighbours and was particularly popular in Scotland and Northern England and amounted to a form of customary blackmail based on a person’s superstition. Generally the householder would happily give an offering to the apparition, thus placating the spirit and ensuring only peace and good omens on his/her household. The term "trick-or-treat" comes from the original idea that if a treat is not given to the person who asks, then a devious (but harmless) trick will be played on the unwilling participant. trouble, Like a hell-broth boil and bubble." " Halloween is huge in my house and we really get into the 'spirits' of things. A few years back, my wife was frustrated with the same old stupid sound effects tape we would play, which ends with the theme from 'Ghostbusters' and 'Monster Mash'. I told her that Halloween is way too cool a holiday to suffer through this every year." "Deep into the darkness peering, long I stood there, wondering, fearing, / Doubting, dreaming dreams no mortal ever dared to dream before." Black cats have long been associated with Witches and Halloween. Many superstitions have evolved about cats. It was believed that witches could change into cats. Some people also believed that cats were the spirits of the dead. One of the best-known superstitions is that of the black cat. If a black cat were to cross your path you would have to turn around and go back because many people believe if you continued bad luck would strike you. Why doesn't Dracula have any friends? To get his boo-ster shot. Where does Count Dracula make his withdrawals? No, they eat the fingers separately... Why don't skeletons ever go out on the town? What did the papa ghost say to the baby ghost? In the Vampire State Building. So every year on the 31st of October the children will dress up in costume and go around the street to neighbours, friends and family going Trick-or-Treating ..
Trick-or-treating was a relatively inexpensive way for an entire community to share the Halloween celebration. In theory, families could also prevent tricks being played on them by providing the neighborhood children with small treats.